Are you looking for a tasty breakfast option for those days when you want a little sweeter start to your day? 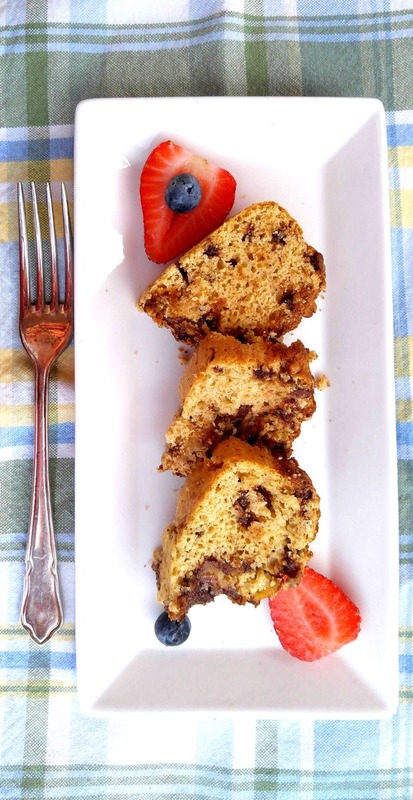 This Gluten Free Chocolate Chip Coffee Cake has loads of flavor and is perfect for brunch on a lazy weekend. It also makes a super dessert! Following a wheat free diet can mean that you have to make some gluten free substitutes or replacements for normal ingredients, but this recipe proves that the taste will still be flavorful and one that your family will enjoy! 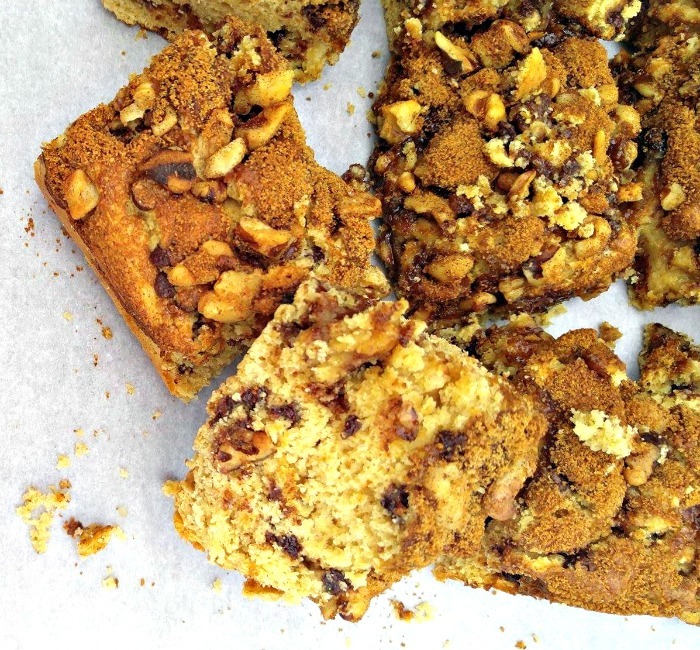 This coffee cake is one of those semi homemade desserts that I feature every so often. I get to feel like it’s home made but my little secret is a time saving cooking product. In today’s case it is a gluten free pancake mix that I bought at Trader Joe’s. As far as my healthy tweaks go, they were pretty simple for this recipe. Often, coffee cakes will contain sour cream to give it a moist consistency. I substituted coconut cream instead of the sour cream. The coconut sugar is a tad more healthy than normal refined white sugar and both give my coffee cake just the faintest hint of coconut. 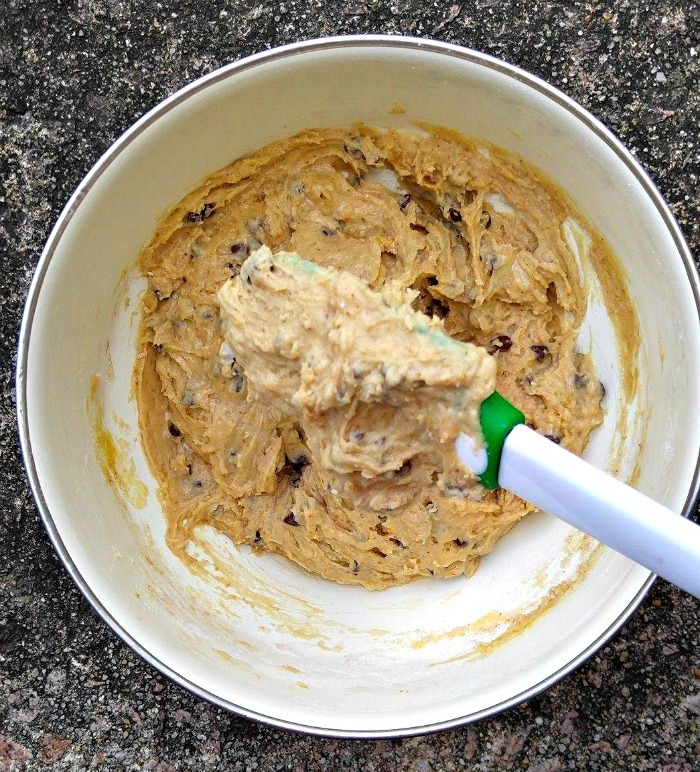 The last of my gluten free recipe substitutes is to use a soy free and dairy free chocolate chip. Coconut sugar comes from the coconut palm tree and is said to be more nutritious and lower on the glycemic index than sugar. It has a dark color which makes the cake look as though it has a brown sugar topping. Bear in mind though, even though it is a slightly better sugar to use than normal refined high fructose sugar, it is still sugar, so should be used in moderation. 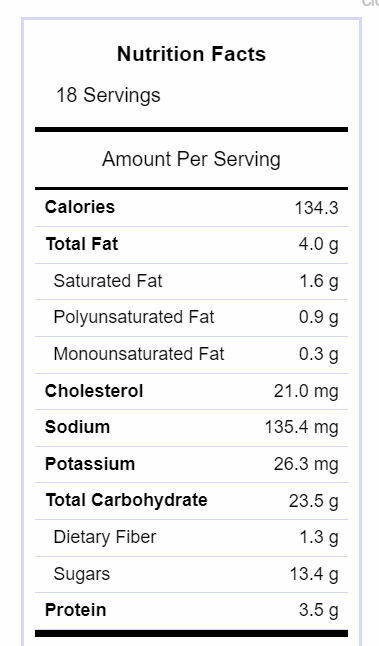 I always cut my sugar down in recipes to the level that gives me the sweet taste I want with the least amount of sugar. It helps to keep later sugar cravings at bay and I find that I just don’t need as much as most recipes ask for. 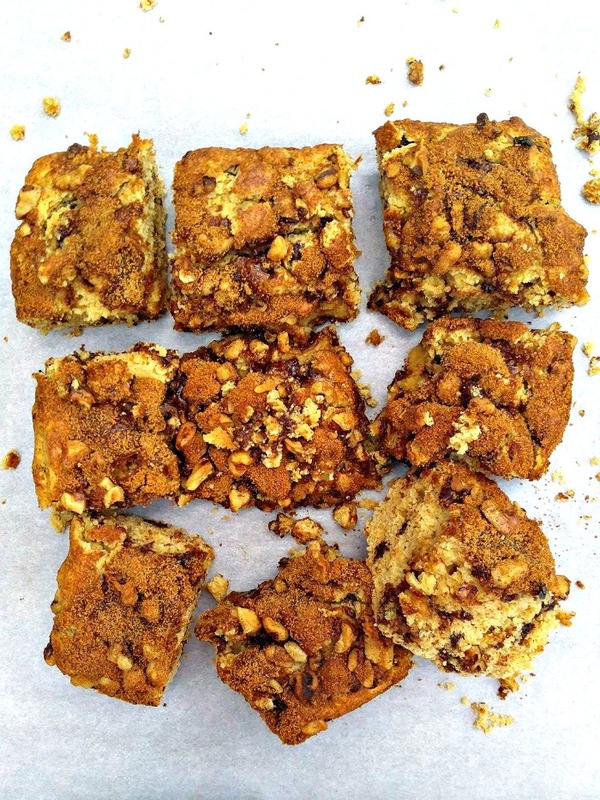 If you have unexpected guests who like to drop on on the weekend for a late brunch, this easy to make coffee cake will be ready in a flash. 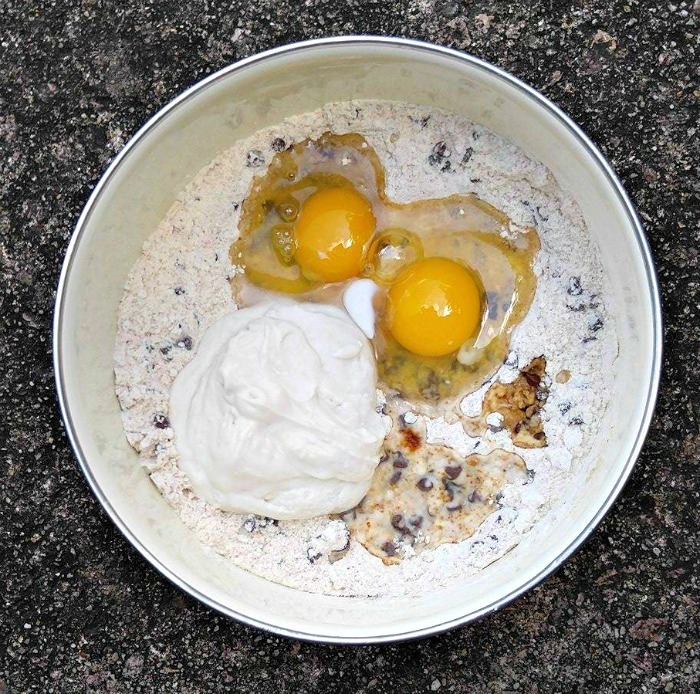 Start by combining the pancake mix, coconut sugar and dark chocolate chips in a medium sized bowl. I like using the mini chocolate chips because they spread out better in the finished batter and incorporate throughout the cake. In goes the water, coconut cream and pure vanilla extract. Mix everything well with a large wooden spoon. You’ll end up with a really thick batter. The batter goes into an 8 x 8 inch pan that has been lined with parchment paper for easy removal later. Parchment paper is such a versatile kitchen tool. I find many uses for it in the kitchen. Next, make the topping by combining the remaining coconut sugar and your chopped walnuts. This mixture gets sprinkled over the batter and the whole thing gets baked for 25 minutes. (about half way through the cooking time I “fluff up” the top layer of the batter to incorporate some of the dry topping down into it.) Super easy! The cake will puff up during cooking to give some hills and valleys for the sugary nut topping. Once the gluten free chocolate chip coffee cake is cooked, let it cool for just a bit and serve it warm. 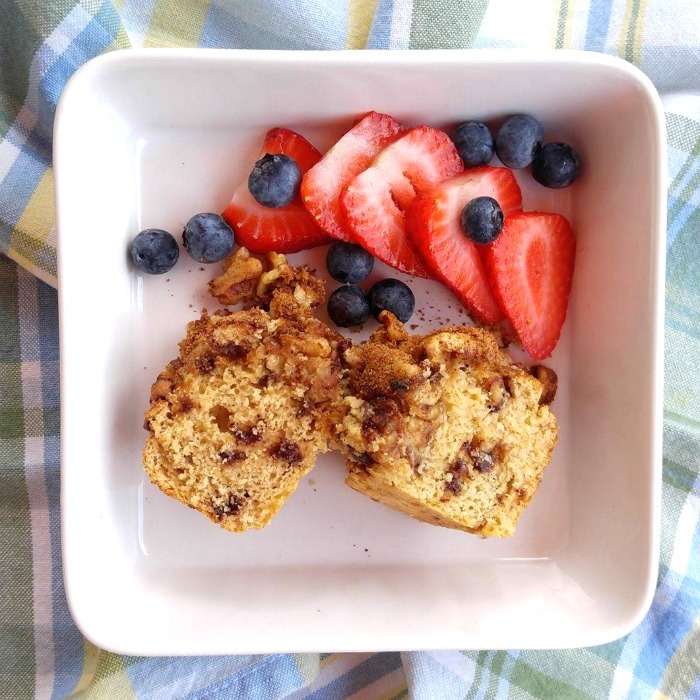 I like to serve this cake with some fresh fruit for a quick and easy breakfast. It also makes a great cold dessert later. Just look at those layers of sweet goodness. Can’t wait to try a piece! And the taste? YUM…it has a bit of the richness from the chocolate, as well as the nutty sweet topping. All of the flavors are spread throughout the cake, so you get a taste of them in each bite. Sometimes, gluten free baking ends up in a more dry result that I might like. 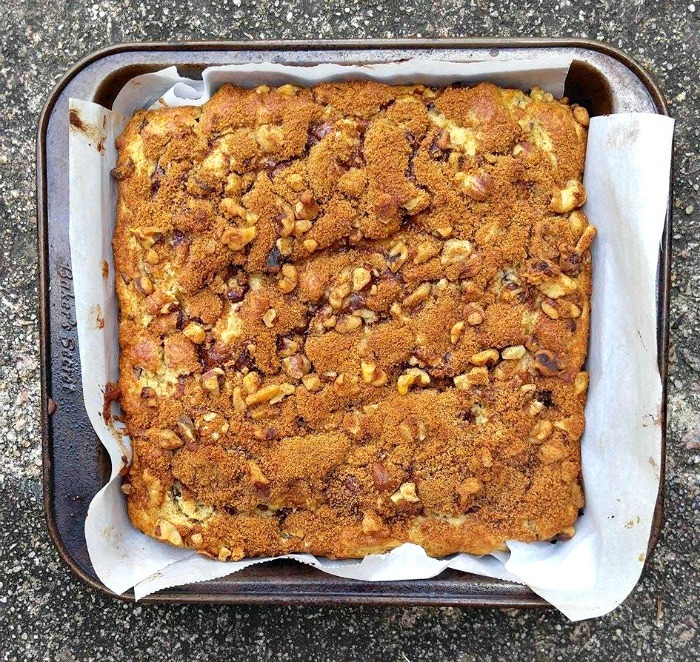 Not the case with this yummy coffee cake though! The coconut cream makes it beautifully moist! 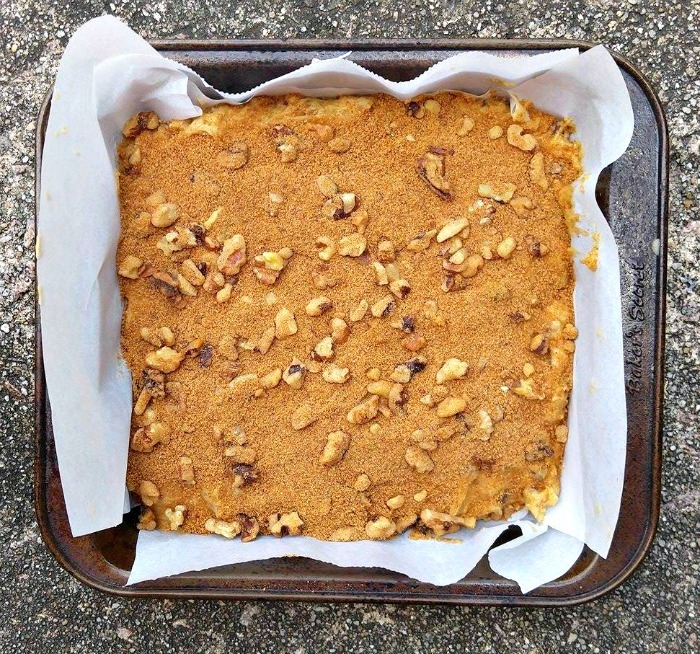 Shhhh…you don’t have to tell your guests that this better for you version of their favorite coffee cake is gluten free, dairy free and fits right into a Paleo diet. That’s our little secret! I originally cut the cake into 9 pieces, since my eyes are bigger than my stomachm but then I sliced them all in half to give me 18 servings. The cake is quite tall and half a piece is plenty, especially since I have not been eating sugar for months. Cutting the cake into smaller pieces keeps the calories down too! Just double the info if you cut it into 9 pieces. 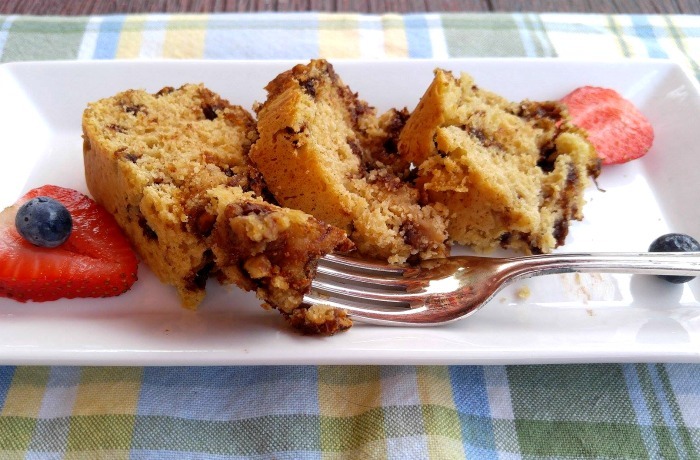 This gluten free chocolate chip coffee cake is the perfect treat to serve on a lazy Saturday morning with a cup of coffee. I also love to use it as a grab and go breakfast later in the week when I am in a hurry in the morning. NOTE: This recipe can easily be made with regular pancake mix, regular sugar and sour cream instead of the coconut cream for a normal diet version. The calories may vary though. This Gluten Free Chocolate Chip Coffee Cake has loads of flavor and is perfect for brunch on a lazy weekend. It also makes a super dessert! Preheat oven to 375 º F. Line an 8 inch pan with parchment paper. 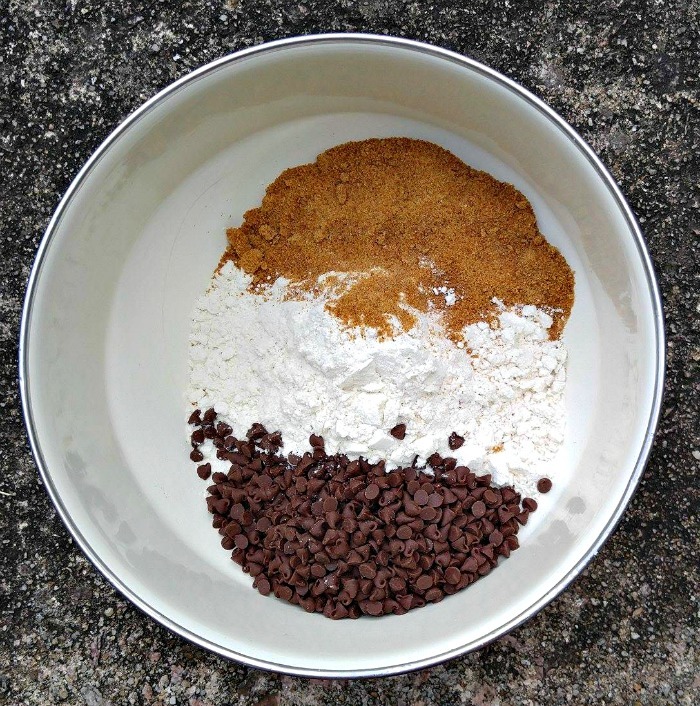 Combine the pancake mix,1/3 cup coconut sugar and chocolate chips in a bowl. Add the water, coconut cream and vanilla extract. Mix until well combined. The batter will be very thick. 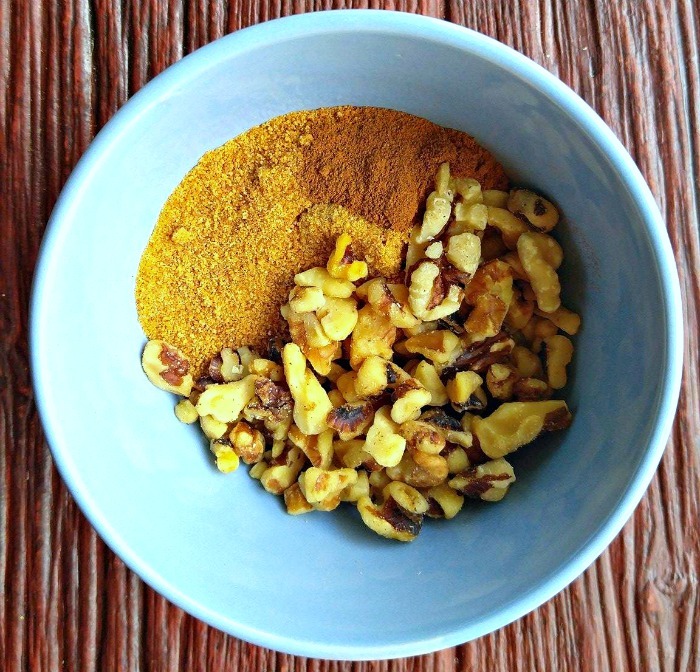 In a separate bowl, combine 3 tbsp of coconut sugar with the cinnamon and chopped nuts. Sprinkle this mixture over the batter. Bake for 25 - 30 minutes until the top is lightly browned and the cake is cooked in the center.. I prick the whole top of the cake half way through baking with a fork to incorporate some of the dry topping ingredients into the moist batter. Cool for a few minutes. 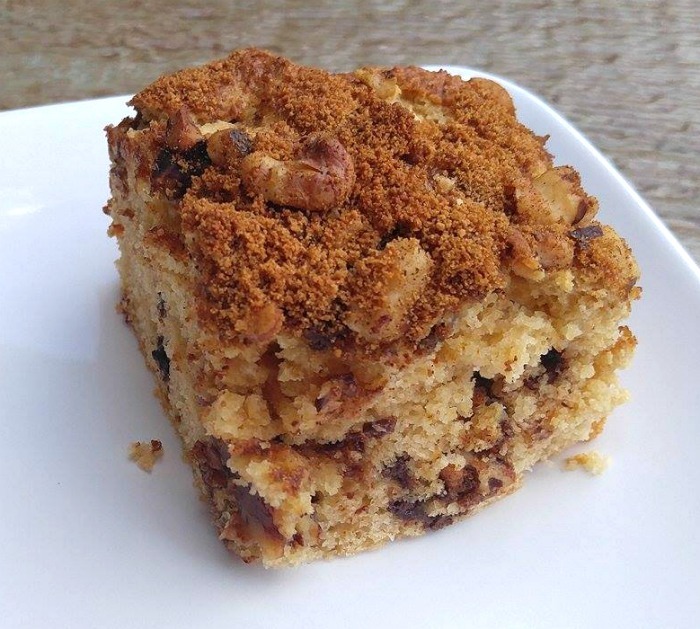 This coffee cake is lovely served warm and also makes a nice cold dessert.